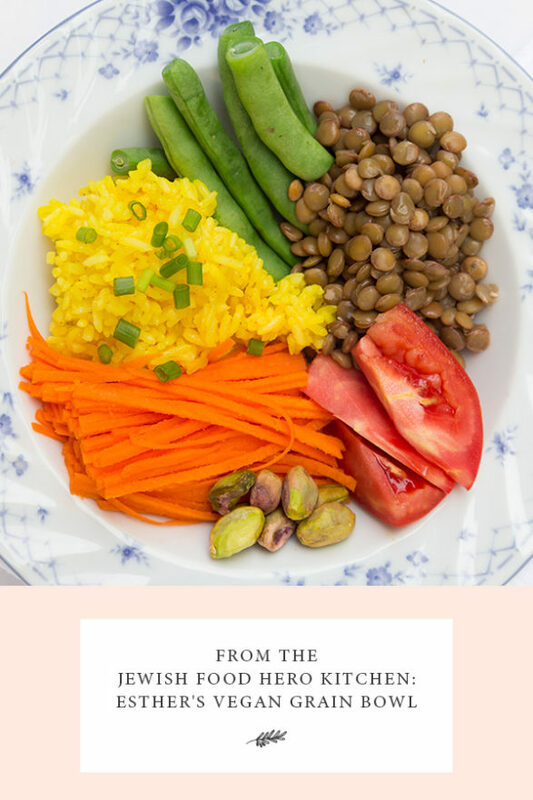 To honor Purim this year, I wanted to create a dish specifically to honor Queen Esther. Hamantaschen are great but they do place all the focus on the story’s villain, Haman. In this day, with all the produce available to us and all the knowledge we have about the impact of our food choices, is it really necessary for us to focus our ceremonial eating on cookies? Who can feel good when they do? I would rather focus on Queen Esther and make food to honor her and honor my own intentions for health at the same time. I find the Talmudic story of Queen Esther’s vegetarianism compelling and inspiring. (It appears in some manuscripts of Megillah 13b.) Queen Esther needed to keep the laws of kashrut while hiding her Jewish heritage, so vegetarianism was the perfect solution. Based on what we know today, it’s highly possible that her switch to eating more fruits, vegetables, tubers, legumes, and whole grains impacted how she felt in her body and in the world. This delicious quinoa bowl for Queen Esther is very hearty and satisfying thanks to the plant-protein in the quinoa in lentils. Feel free to switch out the veggies for whatever you have on hand or with anything that’s seasonal and fresh. The possibilities are endless. This recipe was inspired by the Grain Bowl idea. Rinse quinoa and place in a saucepan with 2 cups of water. Bring to a boil, then reduce heat to medium-low and simmer the quinoa for 12-14 minutes. Allow quinoa to cool for 5 minutes in the saucepan, then stir in the turmeric, lemon juice, and chopped green onion; fluff with a fork. While the quinoa is cooking, in a large pot, cook the lentils in the vegetable broth until the are tender, around 15-20 minutes. Season the lentils once they are done, as adding salt during cooking can make the lentils tough. While the quinoa and lentils are cooking, steam the green beans until they are slightly tender, yet remain bright green, around 2-3 minutes. Once all the components are ready, assemble the Queen Esther’s nourishing bowls by layering the quinoa and lentils on the bottom of each bowl and topping with the veggies, nuts, and a dollop of creamy tahini dressing. Enjoy! In the comments, tell us what recipe you would make for Queen Esther.